You have had a very busy day at work. You get home late, have a quick dinner, and spend a few minutes with your children and spouse. Then you pull out your laptop so you can tie up those loose ends left over from the day. After responding to emails and, of course, distracted by Twitter and Facebook, you decide it’s time to head for the bedroom. You really need a good night’s sleep since you have an important early meeting. 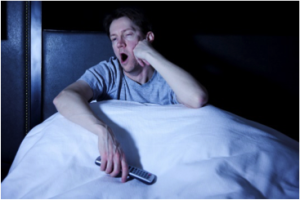 You think that an hour or so of some mindless TV will help you relax and fall asleep. You jump into bed and turn on the TV. If this sounds like you, keep reading. We know how this ends; you have a hard time falling asleep and then you toss and turn all night. You never get the restful sleep you so desperately needed, and then it starts all over again in the morning. With just a few simple adjustments this scenario could change. We will present some specific remedies to help you get a better night’s sleep. We all need and crave sleep. As adults, when we don’t get our appropriate 7 1/2 to 9 hours of sleep each night, it affects our entire life. When we begin the day tired from lack of restful sleep, it affects our ability to focus, our productivity and our energy level. That in turn can lead to irritability. Daytime drowsiness is a real issue if we spend a lot time driving in traffic. How many people per day do you interact with who tell you they are tired? Whether this applies to you, your spouse, or your coworker, it eventually leads to stress. This stress level increases, so when we return home, we have more catch up work, and we try even harder to relax. Some think they are relaxing with a couple of drinks, more television, and more online time connecting with friends – none of this is really helpful and, in fact, has negative consequences so the cycle repeats. How do you break this terrible cycle? There are some very specific remedies to achieve a better night’s sleep. Experiment with these recommended fixes. • Change your nighttime routine. Set a specific time to go to sleep and wake up every day. Your body “clock” will kick in quickly and eventually you will wake before your alarm. • Turn off all digital devices within a few hours of bedtime. That includes computers, e-books, especially those which are backlit, tablets, and smartphones. They all emit a blue light which stimulates the brain making it harder to relax and fall asleep. Turn off the television as well. Instead, try listening to soft music or read by a dim light right before bedtime. Give your mind and body a chance to unwind. • Make your bedroom “sleep ready.” Close the curtains, keep the room cool, make sure you have a comfortable pillow and mattress. Even consider a sleep mask. • Cut back on caffeine and alcohol during the day and evening. Although alcohol can help you drift off to sleep, it will interfere with your deep restorative sleep as the night progresses. Quitting smoking can also help with sleep. • Eat dinner early so your food has a chance to digest properly. • Try not to fall asleep before bedtime. If you feel drowsy find something to keep you awake until your prescribed sleep time. • Counting sheep used to be a cure all. Today, many people find visualization a great tool to fall asleep. Picturing a peaceful setting like the beach and crashing waves is a good example – choose your own! Melatonin is a natural hormone that aids in sleeping and waking cycles. Our body produces melatonin in dim light and darkness. You can help keep your sleep patterns in natural sync by spending as much time outside during the daytime or working near a window with natural light. Our bodies begin to produce melatonin as the light dims at dusk and night falls. This makes sleeping more inviting and supports our sleep patterns. Of course, not all remedies will work for everyone. Experiment until you find the ones which help your individual sleep issues. If you or someone you know is still are having difficulty falling asleep and staying asleep, the cause may be a sleep disorder. At Dr. Walter Heidary General Dentist, we’re here to help. Contact Dr. Heidary for an appointment or consultation about sleep disorders and how they can be treated.